Thanks to its colleges and universities, Massachusetts has one of the best-educated, best-paid workforces in the nation, but a new study shows the gap between the haves and have-nots has widened — especially during the recent recession. The report, scheduled to be issued tomorrow by the Massachusetts Budget and Policy Center, highlights the benefits and challenges of the Commonwealth’s economy: Forty-three percent of the state’s workers have a college degree — a higher percentage than any other state — helping pay and earnings grow more quickly here over the past three decades than in the nation as a whole. But those gains have mostly benefited better-educated workers, insulating them during the economic downturn. Those with less schooling were left to grapple with slower-growing salaries and higher rates of unemployment. According to the MassBudget study, Massachusetts’s median annual income, adjusted for cost of living, rose 24.7 percent, from $47,605 in 1979 to $59,373 in 2009 — more than twice as much as the rest of the nation. Median hourly wages in Massachusetts increased at a faster rate than in any other state, growing 40.25 percent from $14.21 in 1979 to $19.93 in 2009. The median hourly wage for those with a bachelor’s degree rose 32.4 percent; for those with a master’s degree it rose 39.9 percent. But pay for Massachusetts workers with a high school diploma or less rose just 9.6 percent. Just a year apart in age, Yvena Robert and Alice Phinizy, stand at either ends of the spectrum. Phinizy, a 29-year-old Watertown resident, credits her college degrees, including a master’s in business administration, with helping her land increasing wages at successive jobs. Since 2004, her yearly salary has grown from $48,000 a year to $55,000 — more than her husband, who does not have a master’s, she said. “I don’t have to worry every day. I can pay my bills,’’ said Phinizy, who works for a nonprofit that builds affordable housing. But she is still somewhat troubled by the economy. 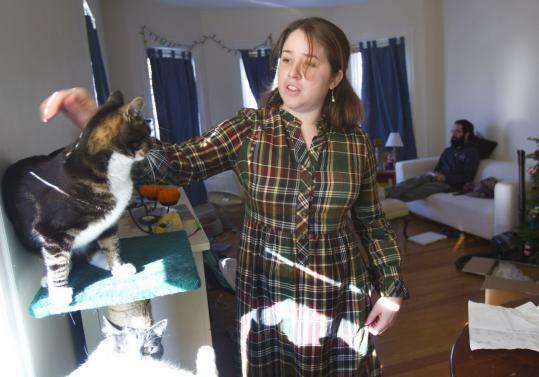 Robert, 28, struggled to get out of a low-paying retail job since family responsibilities and the need to work forced the Cambridge resident to quit classes at Bunker Hill Community College several years ago. She later lost her job and spent nearly two years unemployed. She used that time to go to YMCA Training Inc., a local career center, to learn computer programs and improve her math and to attend public speaking classes. With the new skills, she earned a job working in patient services at Boston Medical Center. The new position pays her $2 an hour more than when she worked in retail and offers a schedule that might allow her to go back to school. Barry Bluestone, dean of Northeastern University’s School of Public Policy and Urban Affairs, said the gains in the state’s economy are heartening but have been “very unequally distributed,’’ leaving workers in middle- and lower-skill jobs at a double disadvantage due to the state’s high cost of living. And Andrew Sum, director of Northeastern’s Center for Labor Market Studies, questioned how well the MassBudget study reflects the current economic picture. While the report notes that Massachusetts lost only 113,000 jobs during the recession, Sum said the state will end the decade with about 200,000 fewer jobs than it started with — one of the worst records for job creation in the country. “With all this human capital, why did we do so badly?’’ Sum asked. Part of the answer, he said, is that Massachusetts is dependent on too few industries, and they cater disproportionately to highly skilled workers — undermining the working class. The state needs to focus more energy on developing its pool of workers with only some college education, or a high school diploma and professional certification, said Ben Forman, research director at MassINC, a Boston public policy research firm. State secretary of education Paul Reville said his department is “painfully conscious’’ of the challenges.